Thanks to Nick and Terry Russell of Gypsy Journal, we knew about Focal Wood Products and their beautiful custom RV furniture. We didn't think we'd get around to it till next year, but when we decided we couldn't justify traveling to the west coast this summer - Indiana seemed a logical alternative. We stopped off at Focal Wood - the business of Carlyle Lehman - before coming to Goshen. Carlyle measured our spaces, and we looked at his samples. We decided on the type of furniture and the placement in about an hour and he said we could pick it up at the end of the month. On the designated day - I felt like it was Christmas morning! We drove the half hour to Nappanee and Carlyle got to work installing the furniture. I was so impressed with how well the wood matched the existing wood in the motorhome! This is the beginning of the dining room and my (Chris) office. Notice the wood on the wall at the left of the picture - can you tell the difference from the cabinets? Here's the finished dining room/office. We put the printer in place to be sure it fit. Then Carlyle started on Jim's office in the living room. Up till now Jim had to put his computer on a TV tray, and we got lots of comments about 'poor Jim.' I made sure I had a computer desk in my area. We took my desk to a local Good Will. It's no more Poor Jim! Here's Carlyle installing Jim's desk. Yes, Carlyle is Amish and many people believe you can't take pictures of the Amish. Not true. What they can't do is *pose* for pictures because that is considered a sign of pride. It's pride that is against their religion, not pictures. Rarely do any Amish people take pictures .. no family albums, no pictures on the wall. 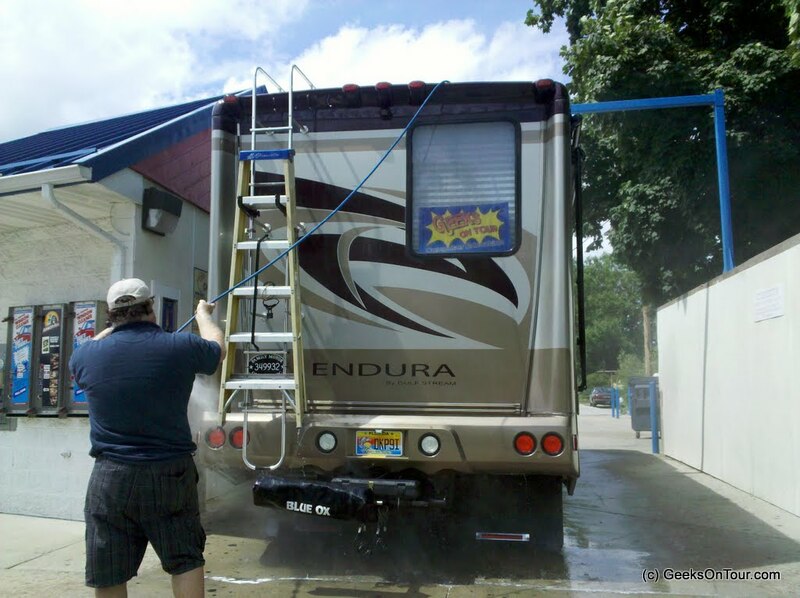 When we were done and headed back to the fairgrounds, we knew there was a carwash with a RV/Truck bay - we figured the outside needed to be beautiful too since the inside was so nice. I know ... we probably should get out the Dry Wash, or Gel Gloss or something ... but that's just not going to happen. We felt lucky to be able to get the dust and dirt off in such a convenient way! So, here's the finished interior. Whaddaya think? Chris' office. My commute from breakfast to work is simply swiveling my chair! The cabinets left of the dining table are slide out pantry drawers. And the cupboards in the middle are storage too. No more complaining about working on a TV tray! Notice the slideout printer tray lower right. And the TV on the wall is connected to another computer operated with the wireless keyboard on Jim's desk. Now *that's* a file drawer! And there's still room for shoes by the door. This window sill would never have occurred to us if we hadn't seen it in FocalWood's brochure. What a great finishing touch! No Odie ... you can't have the wine. We're getting much more sociable now that we have the facilities. 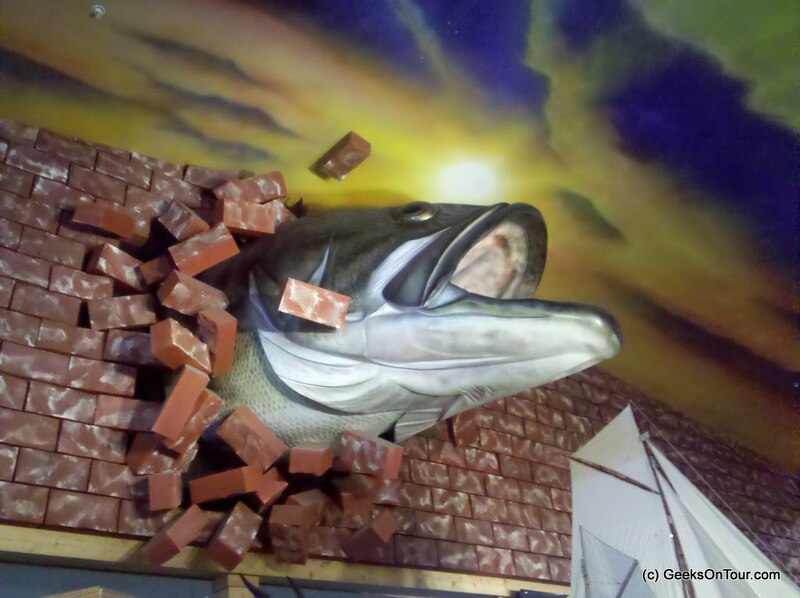 Here's our friend, Al Hesselbart over for dinner. Notice that the table is extended with a leaf. This next improvement is unrelated to the custom furniture, but another enhancement. Jim went to RV Surplus and picked up some countertop pieces and the hardware to make an extension. It really helps to have a little more counter space. And notice the dog bowl holder on the floor - we picked that up at the Shipshewana flea market. 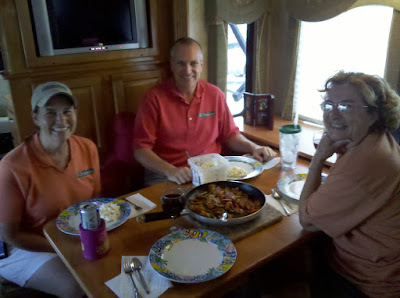 Last week we joined our neighbors, Howard and Linda, at their RV for a cookout with 2 other couples. 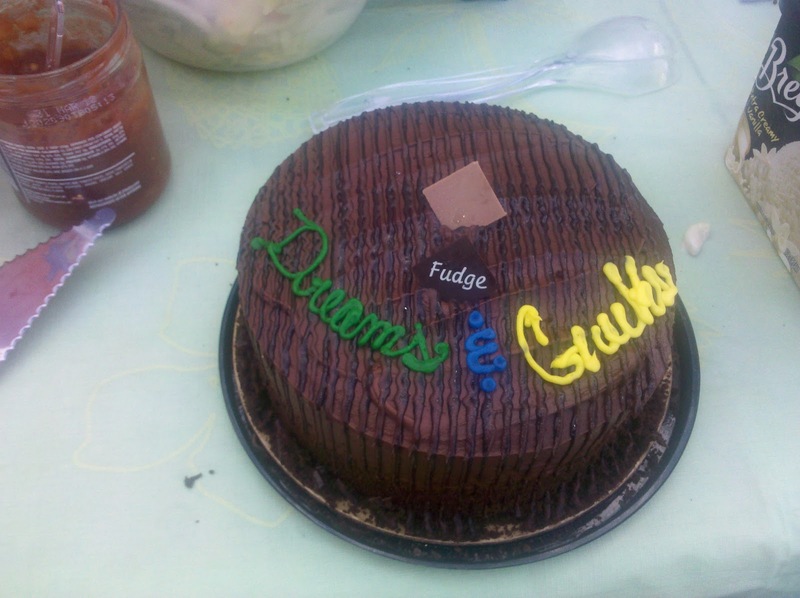 'Dreams and Geeks' That's what Linda wrote on the cake she brought. Is that cute or what! In case you don't understand the reference, Linda and Howard Payne are fulltime RVers and run the website/community RV-Dreams. We met them at their first RV-Dreams rally in Branson, Missouri in 2008. Since then we've crossed paths a few times and we can always keep up with them via their RV-Dreams Journal. We've been able to hang out and get to know them better this month because we were both parked at the Elkhart County 4-H Fairgrounds. We are envious that Linda and Howard do a lot more 'Real' RVing than we do. They make an effort to find beautiful campgrounds with what they call the 'It' factor. You know, the ones where just looking out your window takes your breath away. They spent last winter exploring Florida and visited several places that we didn't even know about! I will use their blog as our 'todo' list of places to visit in Florida. We both are trying to support our lifestyle with our websites. We chose to go the membership route - you must pay a membership fee to see all our videos. They chose the free-to-all route and use advertising, donations, and rallies, to earn their living. Their website is chock-a-block full of information for fulltime RVers and, especially the wannabees who haven't made the decision yet. If that's you, be sure to check out their page 'Is the RV Dream Right for You? They also sell some products like hats, cookbooks, and spreadsheets to track RV lifestyle expenses. It is only because of this new job of theirs that they were here. The fairgrounds definitely does not have the 'It' factor. Well ... unless you add cow and horse sh .. before it! We really enjoyed spending time with them and wish them well in their endeavors. We're hoping to be able to pop in to their rally later this year at the Hershey Thousand Trails. Oh - and Thanks Linda and Howard for helping us initiate our new dining room table! This past week at Elkhart County Fairgrounds there was a rally called RV Fest. Since we were going to be here anyway, we had contacted the organizer and asked if he'd be interested in having us present our Seminars. We also knew that there were a lot of GulfStream owners attending this rally ... and we now own a GulfStream! The best part of RVing is the people you meet. The organizer of this rally is Les Potteiger and we really enjoyed getting to know him. Les had a military career as a physicist. When he retired and started RVing, he was a 'wagonmaster' (rally organizer) for GulfStream. 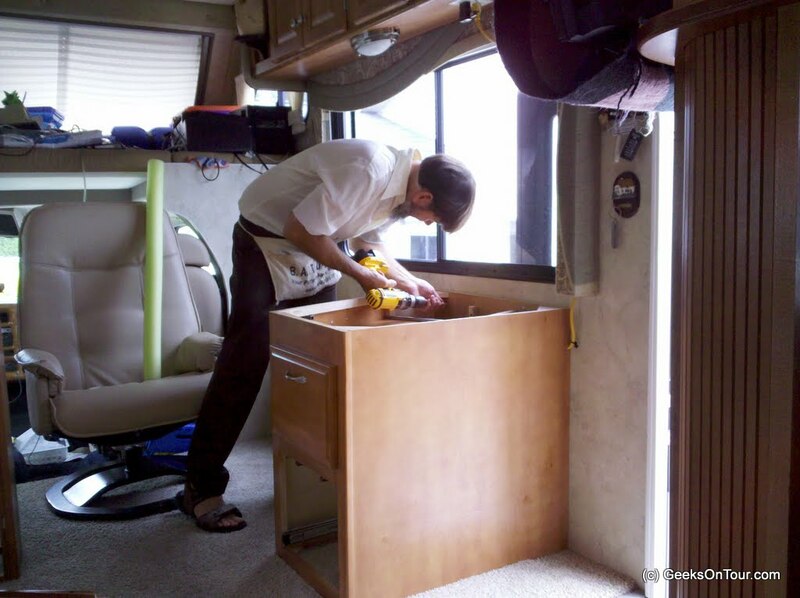 He has also led RV Caravans to Alaska, and now he is organizing a series of these RV Fests. As part of our week we helped Les set up a blog/website for RV Fest so he could have a place to promote future events. Check it out at www.rvfest.blogspot.com and read about the great event he has planned for Christmas in Branson. We really enjoyed the rally being a full week. I don't know why more rallies don't do it that way. It was relaxed and there was plenty of time for folks to get to know each other. We were able to hold an impromptu 'Smart Phone Roundtable' where we taught ... and learned ... things about using Droids and iPhones. That was fun ... we'll do that again. 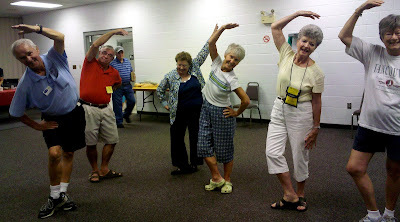 We also took advantage of the morning stretch class led by John. What a great way to start the day. No, I’m not writing to say it happened to us – it hasn’t – I’m writing because it’s something we all need to think about *before* it happens. Maybe it can be prevented or contained and, most importantly you need to think about how to keep yourself safe if it should ever happen to you. RV Fires happen often enough that we personally know of two incidents where RV fires completely destroyed the RV of people who were (still are) fulltimers Just last week a fire destroyed the 5th Wheel home of Ed and Marilyn Dray “The Happy Wanderers.” Here is their blog post where you can read about Ed and Marilyn’s horrible day. The other incident happened a few years ago to people we knew thru being a Motosat Dealer – Gary and Karen Swaim. Their horrific story persists in the back of my mind and I never take our home and belongings for granted – it can all be gone so quickly. Here’s the web page where they write about Gary and Karen’s horrible day. 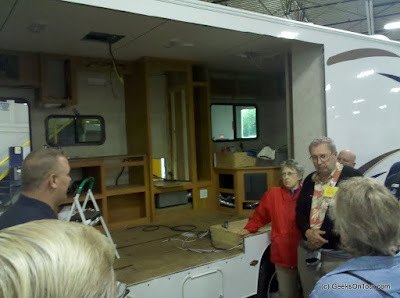 If you’ve ever been to a large RV rally, you’ve probably heard of the fire safety classes presented by Mac McCoy. If you’re an RVer and you haven’t taken this class, you should. We’ve taken it 2 or 3 times and heard his message that you need to test your RVs escape route – but we’ve never done it. I’ve been afraid to push out the window with the EXIT message on it for fear that the window falls out! Well, Mac was parked right next to us for over a week here at Goshen. When we heard about Ed and Marilyn, I told Jim – let’s ask Mac to come over and show us exactly how the EXIT window works. He did. It was embarrassingly easy! I just opened the red levers and pushed. The window opened and it didn’t fall out! As long as he was there, he took a look at our fire extinguishers. We had three that we bought from him a couple years ago, and one that came with the coach. The three were good – but the one that came with the coach was empty. He took that one and we ordered a ‘P Can’ type of extinguisher that we’ll pick up from him in Madison where we’ll both be presenting our seminars at the FMCA Convention. Short video clip of Mac’s Fire Safety Class. As part of the RV Fest rally we’re attending this week, there was a factory tour at Nexus. This is a new, Class B and C factory. The unique twist that they offer is that you can buy your RV right at the factory. They deal direct with the customer instead of thru dealers. You can come to the factory, pick out or custom order your RV, then live in it for a day or two at the RV sites provided before you drive away. 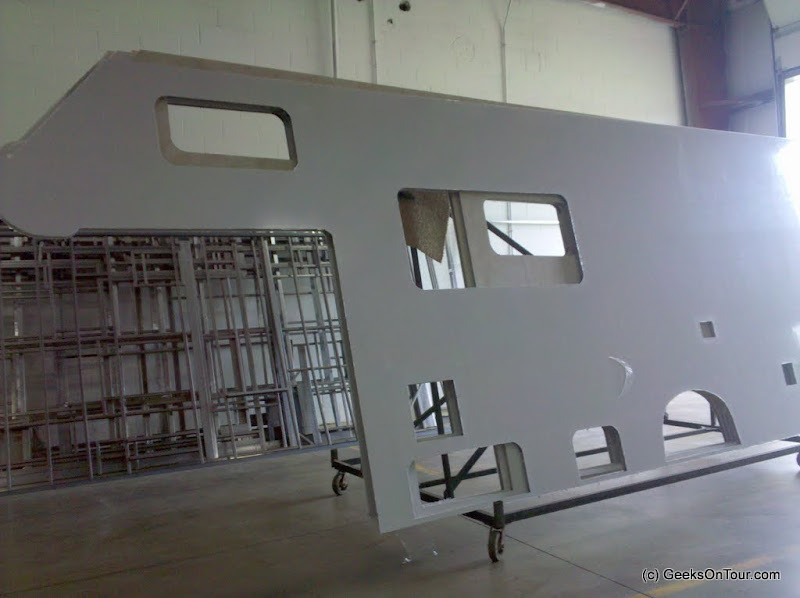 It was started by two men who used to work at Gulfstream (that’s the manufacturer of our current RV) – Claude Donati and David Middleton. David Middleton led our group on the tour. This was the first time we have toured a factory. 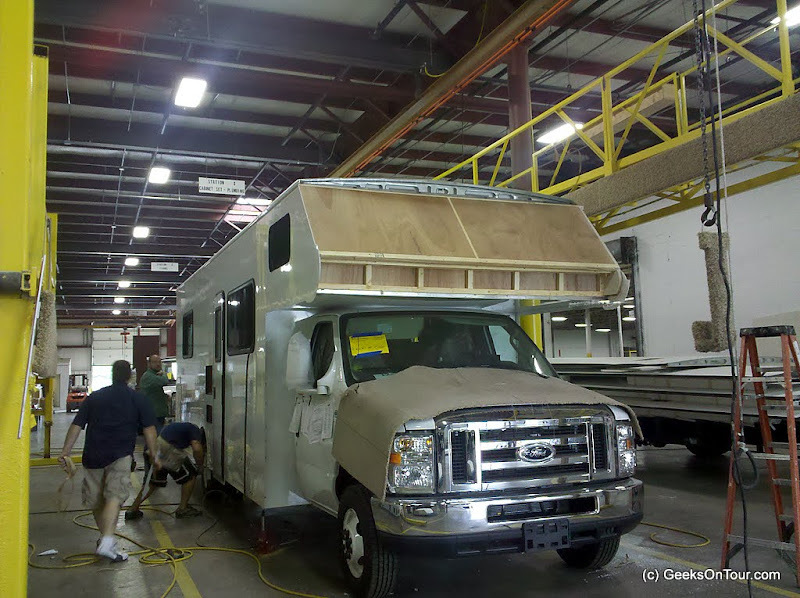 I liked seeing the RVs in the different stages of construction. They start as empty chassis. Then, all the tanks, generators etc. get installed on the chassis, the floor goes on and interior walls go up. Then comes the outer shell. Here are several side walls waiting for RVs. See how they go on. A little more work on the interior: plumbing, wiring, carpet, furniture etc. And, finally, the completed product is weighed. Most of the units we saw being build were for an order of 50 motorhomes by an RV rental company in Anchorage, Alaska. 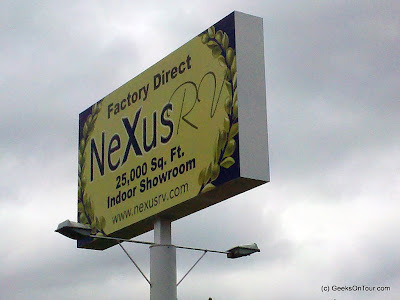 Thanks David and NexusRV for the excellent tour, the tshirt and goodie bags, as well as the ice cream and then wine. Do ya think they know what RVers like?! 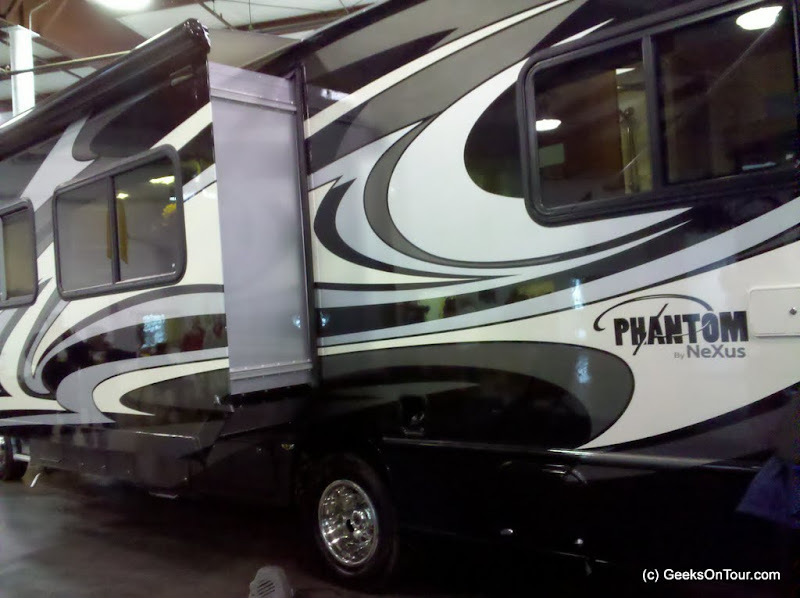 Here’s one of the retail motorhomes on their showroom floor – the Phantom. I just discovered a new place to see our videos. Yep, that’s right, even Jim and I – who make the videos – can’t keep up with where they go! We use a service from Google called Google Alerts to alert us whenever the words “Geeks on Tour” appears anywhere on the web. I get an email once a day whenever a mention is found. Usually I recognize the items showing in the email. For example, this blog post will show up because I wrote ‘Geeks on Tour’ in the title. Whenever one of you who are reading this blog mention Geeks on Tour in your blogs – I usually get a notice to that effect from Google Alerts. But today, I got a notice that there is a page on Youtube that lists Videos that have been embedded on the Geeks on Tour Blog. I don’t know when this started, or how exactly it got there. But, I like it. It’s a good thing I like it! Because I don’t know how it was created, and I couldn’t stop it if I wanted to. It all has to do with the fact that we posted these videos on Youtube - owned by Google - and we used them on our Blogger blog – also owned by Google. Thank you Youtube for promoting our Blog – because it promotes your service. Kind of a ‘I’ll scratch your back because you scratched mine.’ That’s how the social web works. I know that whenever I post a video on Youtube, I am putting them in the public domain. So I only put up there the videos that I want to freely share. I don’t put our ‘Members Only’ videos on Youtube because we charge $ for those. We have a ‘channel’ on Youtube also. It’s at www.youtube.com/2geeksontour … notice the ‘2’ before geeksontour. That’s because somebody else got the GeeksOnTour youtube account name before us! The nerve! I don’t know who they are, and they haven’t uploaded any videos so its aggravating to think that some people might go there thinking that we have no videos. Such is the digital world we live in! Our friend, Joline, calls her RV ‘Brightwing’ and I have a special place in my memory for Brightwing as it was the first RV I ever saw with a Datastorm Internet Satellite dish. Joline was way ahead of her time! A single woman, traveling alone, she wanted to stay connected, and in 2002 a Datastorm was the only way to do it. She’s upgraded several times since then. A working Datastorm is still on Brightwing’s roof. Joline knew my Mom and took Mom and me on an RV trip to the Florida Keys back in January 2003. I was so impressed with Joline’s independent lifestyle! Brightwing helped point the way to Jim’s and my life on the road! Now Joline is hanging up the keys, and I’d love to help find Brightwing a new home. If you’re interested, please leave a comment to this post – I’ll make sure she gets it. Brightwing and ‘Oh Boy’ have met up several times over the years. TRAILER, a Titanium 5th Wheel, Model # 24E29, Year 2002. with one daveno slide made by Glendale Recreational Vehicles, Ontario, Canada, 6500 (not a typo) pounds dry weight, including hitch weight. Twin beds, central vacuum, two 30-pound propane bottles (actual total 14 gallons) sewage tank flush system, huge underbed storage capacity, holding tank capacities: Fresh 48; Gray 41; Sewage 41, exterior rinse shower, tinted thermopane solar reflective glass windows, exterior sound center, dinette with dropleaf with 2 upholstered chairs, ceramic flush toilet, plus usual appliances: 3 burner gas stove with oven (never used), large 2-way refrigerator-freezer, furnace, water heater, microwave, A/C. A number of items were upgrades by the manufacturer. Original Upgrades: 2 Fantastic Fans, extra folding dining chair, living room chair and ottoman, 19' A&E awning motorized, motorized rear jacks, Onan 2500 W. generator, solar system (runs everything but A/C for 5-7 hours at end of day, including electronics; built in stereo radio/10 disk CD player, bathroom folding towel rack mounted on tub wall, bedroom oak bookshelves made to order; another made to order oak railing for top of refrigerator, where I carry my toaster oven. 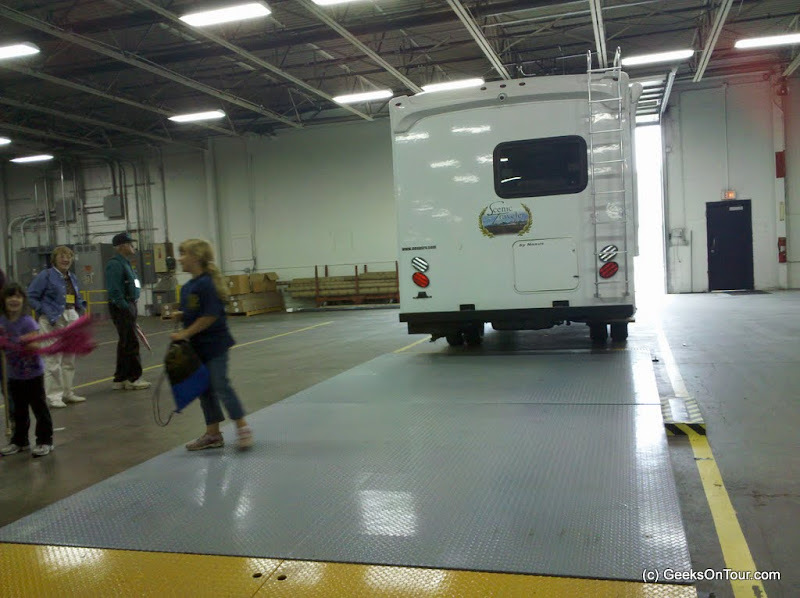 OTHER ADD-ONS: truck bedliner, automatic steps to get in/out of truck, towing mirrors, truck-trailer brakes, tire step (a device that fits over a rear tire so I can stand on it and reach into the back of the truck to hook up and unhook), Husky 5th wheel hitch. TRUCK - 2002 Chevrolet Silverado 2500 (diesel) 4 X 4 extended cab LT, shortbed with Allison transmission, towing package, leather seats, heated seats in winter, tinted windows, 3 power outlets, Sirius satellite radio (added after), Onstar (not available after 2007), surround sound plus separate CD & tape player, 107,000 miles. Here are pictures of the interior. Click on the slideshow to go to full size on the web album. Please leave a comment if you’re interested. Good Luck Joline! See ya next time we’re out Albuquerque way. Yesterday was the last day for the Heartland Vendor Mart, so we broke down the booth and drove over to Wally World to get some fine box wine for dinner. The pork chop meal was good and conversation with our table-mates was great. After dessert, the entertainment was Dueling Pianos. They did a bunch of familiar tunes and had everyone laughing with their antics and audience participation. Chris scheduled an Asian Reflexology massage this morning with Jean Damon, so her husband Dave and I took a walk over to where a Soap Box Derby track was set up at the fairgrounds. These are local trials in preparation for the finals held in Akron, Ohio every July. The kids were having a blast! This is serious business for some. The Heartland Rally attendees were all invited to a factory tour and luncheon today followed by a visit to the RV/MH Hall of Fame and Museum. Our friend Al Hesselbart, the historian there asked Chris and me to help out when all the Heartlanders toured the museum. We were glad to do it. 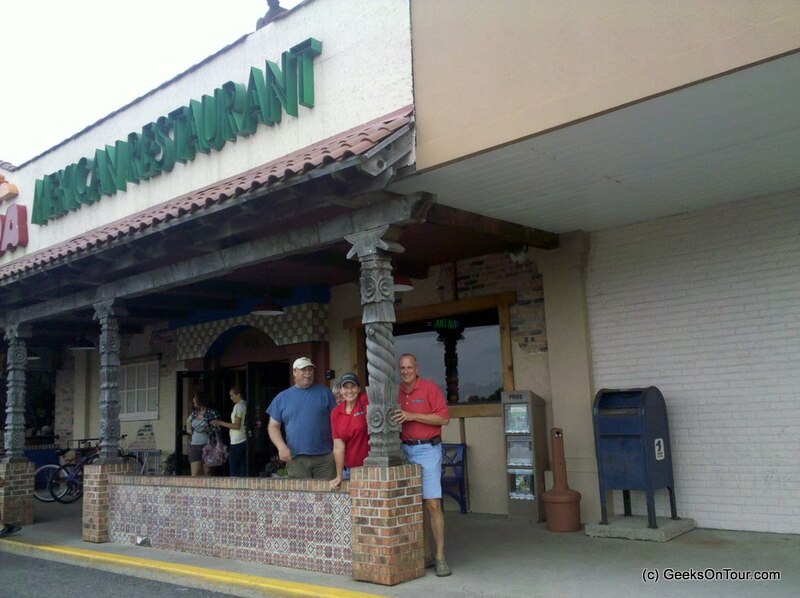 If you get the chance, it is a great place to visit in the Elkhart area. Don’t wait too long though, if they don’t get some serious industry support soon, they may have to close their doors as early as September. That would be a real shame. 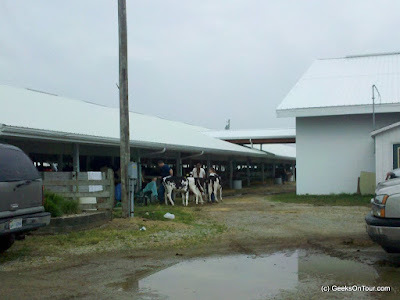 Back at the fairgrounds, we joined the Heartland Owners Club members for another catered dinner. The entertainment tonight was a hypnotist/comedian, but we didn’t stay long. The PA system sounded bad where we were sitting. Besides, we were beat from being on our feet all afternoon. All in all, a very satisfying day. Before I forget, Happy Fathers Day to all the dads out there. Most especially my own wonderful dad in Fort Lauderdale. I love you. For my son, Devon, Happy Fathers day too, father to my grandkids. And to Chris’ dad, Tom Van in Dunnellon, a very happy day. I now return control of this blog to Chris. However, as it turns out, we do have some wonderful neighbors: Walter and Amy Cannon of RV SEF, Howard and Linda of RV-Dreams, and just yesterday Bill and Janet Adams of Internet Anywhere. Jim, Linda and Howard -Walter hiding and Amy out of sight! They took us out for ice cream. Does this look like an ice cream place to you? The evening will now be known as the Hunt for Rocket Science Ice cream. We also drove up to the RV Museum and Hall of Fame one day, grabbed Al Hesselbart and went to dinner at Lunkers. The reason we're here is the Heartland rally this week, but we decided to pay the $450 to stay all month and get some projects done. Although it's not the campground you dream about when you start RVing, it does have full hookup paved sites with 50amp electricity and free Wi-Fi, so we're all set to sit here and work. We took our rig in to RV One for overall check-out and sealing the roof. They pointed out some pretty serious wood rot around the Fan in the kitchen area and gave Jim some suggestions for how to deal with it. Water is an RVs worst enemy, and it appears that a bunch of it got into our roof over the years before we bought it. That is a very worrisome thing and had us a bit depressed. Then they cheered us up by saying that the slide-outs were in really *good* shape. More solid than just about any they'd seen, and the mechanics of moving them out and in were also very smooth. Never having had slides before, this was really good news. After Jim cleared the bulk of the rotten wood out of the fan area. As for me - I've been at the computer working on some new tutorial videos. Click the link below and watch this one OK? It's only 7 minutes long. It's about Blogger and how you can build much more than a blog with it. With Blogger's 'Pages' feature, you can make a regular website ... all Free - pretty cool. The video shows you what a page is, how to create it, and how to make a menu with tabs at the top of your blog. Then, you'll see a sample of a business website using Blogger - the one built by Devon with less than an hour instruction by me. I'm leaving this video free as a 'Featured' video for a month or so. Of course, if you want to see the other 29 videos on using Blogger, you need to become a member for $39/year! And, we'd appreciate it if you did :-), that's how we make our living, and we love it! Check out the Learning Library to see all the other topics we offer as well. One other project that has been on my list is eyeglasses. I haven't gotten new eyeglasses in over 4 years and I find myself squinting and going thru all sorts of contortions trying to read things lately. When you're on the road, what do you do about these things? We go to Walmart. I was actually very impressed with the professionalism, and the equipment in the Walmart Vision Center. They had several pieces of equipment for eye tests that I had never seen before. And the price was also very nice. $204 for eye exam, prescription, frames and progressive glasses using polycarbonate - the more expensive choice. It was a long time ago, but I think my last pair of glasses were over $400. It takes a week to get here but that's ok! We'll still be here. And then, my information will be in the Walmart computers so I can go to any one around the country from now on.